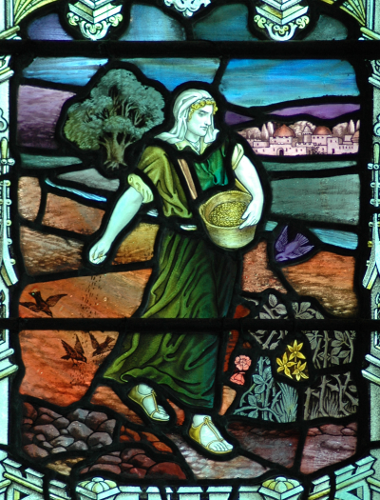 St Sampson(centre) : Archbishops Temple(left) : Benson(right), with Sower, Harvest at Bethshemeth, Ruth in predellas. John and Ann Hitchins and their sons William Hitchins, John Hitchins and Henry Hitchins. TDF 23/9/12. TDC 1913 : 150. In loving memory of John and Ann Hitchins and their three sons William, John and Henry 1912 . Photograph copyright © www.asnapintime.co.uk, used with permission of Ryan Smith. Left-hand light. Archbishop Temple is shown holding a royal crown in his right hand, a reference to his officiation at the coronation of King Edward Ⅶ and Queen Alexandra in 1902 . Photograph copyright © www.asnapintime.co.uk, used with permission of Ryan Smith. Left-hand light. Archbishop Temple, detail. Photograph copyright © www.asnapintime.co.uk, used with permission of Ryan Smith. Centre light. St Sampson, patronal saint of the church. Photograph copyright © www.asnapintime.co.uk, used with permission of Ryan Smith. Centre light. St Sampson, detail. Photograph copyright © www.asnapintime.co.uk, used with permission of Ryan Smith. Right-hand light. Archbishop Benson is shown holding a model of Truro Cathedral in his left hand and a pastoral staff in his right hand. Photograph copyright © www.asnapintime.co.uk, used with permission of Ryan Smith. Right-hand light. Archbishop Benson, detail. Photograph copyright © www.asnapintime.co.uk, used with permission of Ryan Smith. 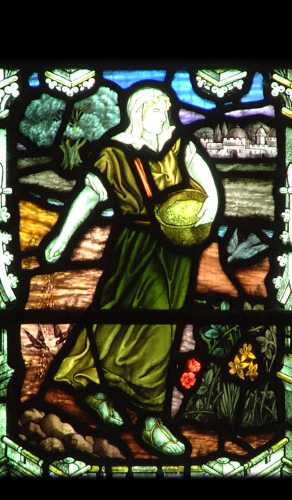 Left-hand predella: the Sower. Photograph copyright © www.asnapintime.co.uk, used with permission of Ryan Smith. Left-hand predella: the Sower, detail. Photograph copyright © www.asnapintime.co.uk, used with permission of Ryan Smith. Centre predella: the harvest at Bethshemeth Photograph copyright © www.asnapintime.co.uk, used with permission of Ryan Smith. Centre predella: the harvest at Bethshemeth, detail Photograph copyright © www.asnapintime.co.uk, used with permission of Ryan Smith. Right-hand predella: Ruth Photograph copyright © www.asnapintime.co.uk, used with permission of Ryan Smith. Right-hand predella: Ruth, detail. Photograph copyright © www.asnapintime.co.uk, used with permission of Ryan Smith. Left, the left-hand light of St Stephen-by-Saltash North aisle 2, centre, the left-hand predella of South Hill North transept north, right, the left-hand predella of Landulph, South chapel east, showing re-use of the design for the sower. Photographs copyright © www.asnapintime.co.uk, used with permission of Ryan Smith.